_Lecture-Performance about the surrealist artist Luis Buñuel. This project invites the viewer to enter Buñuel’s complex world through rigorous historical research on all the films and other sources mentioned by Buñuel in his auto-biography The Last Sigh. The event opens with cocktails prepared and served on stage, following Buñuel’s own recipe for dry Martini’s, and then continues with a dialogue between the presenter, Paco Cao, and a simultaneous film projection specifically produced for the lecture. Luis Buñuel at War examines Buñuel’s moral, social, political, and aesthetic views, emphasizing his active involvement in politics, first working for the Government of the Spanish Republic during the Spanish Civil War(1936-1939) and later as Counselor and Chief editor in MoMA’s Office of Coordinator of InterAmerican Affairs (1940-1943). 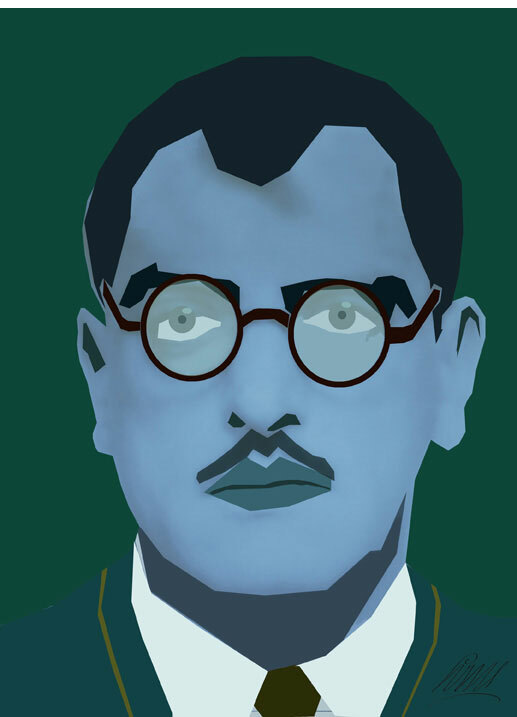 To pay tribute to Buñuel´s fantasy a fictional character –Hugo EB– was created for the lecture. An active member of the Parisian avant-garde, Hugo EB took the signature of King Louis XIV of France and signed several of his works with it, including the portrait of Buñuel reproduced here.